Family and friends are trying to build a reflexology footpath in memory of the victim of a tragic bike accident. 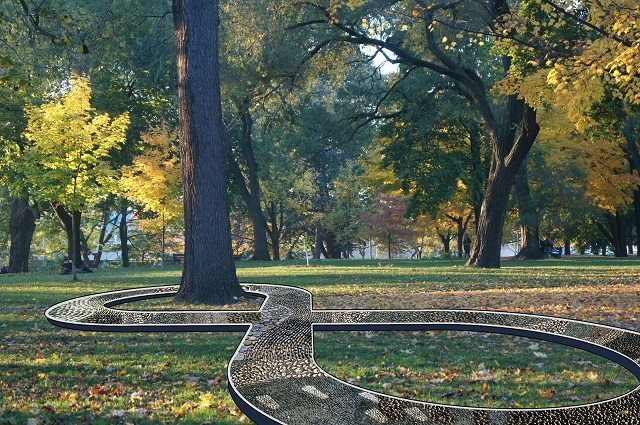 A conceptual rendering of the Jenna K. Morrison Memorial Reflexology Footpath. Courtesy of Aron Slipacoff. It is impossible to overstate the tragedy of Jenna Morrison’s death. Struck and killed at age 38 by a truck while cycling to pick her son up from school, Morrison was mourned not only by the scores of Torontonians who knew her well, but by the thousands more who were stunned by her story. Now, more than 18 months later, her husband, Florian Schuck, and the people whose lives Morrison touched most, are fighting to fund a one-of-a-kind tribute, the Jenna K. Morrison Memorial Reflexology Footpath in Dufferin Grove Park. The design came to Schuck “almost as a vision,” according family friend and proponent of the memorial, Aron Slipacoff. Together, Schuck and Slipacoff submitted a proposal to the City in 2012, complete with renderings and concept drawings. In theory, the memorial is a done deal. The City has approved the project, and has already lined up a landscape architect to assist with budget preparation and design consultation. But before construction can start, Schuck will have to raise a total of $120,000. As part of a sustainable maintenance plan, the money Schuck raises will cover not only construction, but the maintenance costs associated with the memorial, which normally would have to be paid by the City. So far, only $21,000 has been raised. The City’s parks division has helped Schuck and his supporters set up an online donation page, allowing them to cast a wider fundraising net, and to issue tax receipts to donors. With the fundraising goal still nearly $90,000 away, Slipacoff is nevertheless encouraged by the recognition the memorial has received. As he is quick to point out, Google search results for the term “reflexology footpath” are dominated by stories relating to the Morrison memorial. Morrison discovered, and became enraptured with, reflexology paths during a 2001 trip to South Korea. She always dreamed of creating one here at home. The memorial’s proposed site, in Dufferin Grove Park, is a favourite visiting place for Schuck and Morrison’s six-year-old son, Lucas. “It would be great for [Lucas] to physically access a site that reflects the spirit of his mother,” Schuck wrote to the City. Despite the gap in funding, the resolve of Morrison’s friends and family remains strong. In a short time, they hope, they will have created a means of making local residents happier and healthier, just as Morrison always wanted to do. CORRECTION: 10:44 AM This post originally misspelled Aron Slipacoff’s last name. CORRECTION: May 13, 2012, 6:30 PM This post originally misspelled Florian Schuck’s last name, it has been corrected.